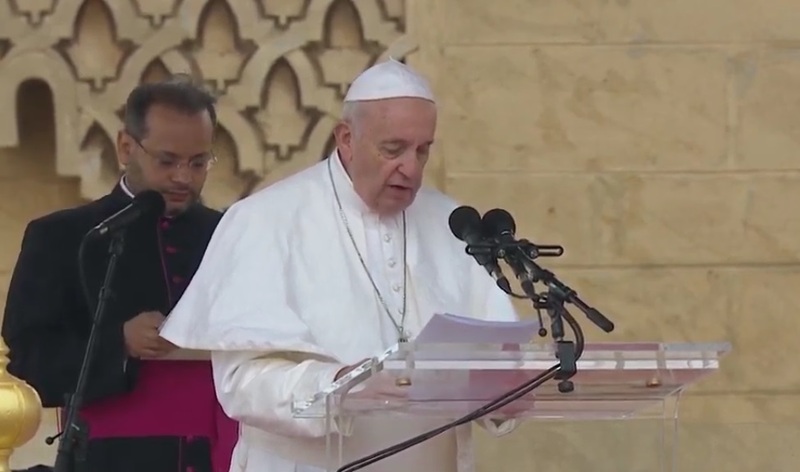 The official translation of the speech of Pope Francis, delivered Saturday in Rabat before the king Mohammed VI. Pope Francis delivering his speech before the king of Morocco during his visit to Morocco. Rabat – Pope Francis delivered Saturday in Rabat a speech at the official welcome ceremony held in his honor at the Esplanade of the Hassan Mosque, which was chaired by His Majesty King Mohammed VI, Commander of the Faithful. This visit is for me an occasion of joy and gratitude, for it allows me to see at first hand the richness of your land, your people and your traditions. I am also grateful that my visit offers a significant opportunity for advancing inter-religious dialogue and mutual understanding among the followers of our two religions, as we commemorate – at a distance of eight centuries – the historic meeting between Saint Francis of Assisi and Sultan al-Malik al-Kamil. That prophetic event shows that the courage to encounter one another and extend a hand of friendship is a pathway of peace and harmony for humanity, whereas extremism and hatred cause division and destruction. It is my hope that our mutual esteem, respect and cooperation will help strengthen the bonds of sincere friendship, and enable our communities to prepare a better future for coming generations. The International Conference on the rights of religious minorities in Muslim countries, held in Marrakech in January 2016, addressed this issue, and I am pleased to note that it condemned, in effect, any exploitation of religion as a means of discriminating against or attacking others. It also stressed the need to move beyond the concept of religious minority in favor of that of citizenship and the recognition of the value of the person, which must have a central place in every legal system.